I was introduced to Dennis Akagha by a friend on my Masters in Global Health & Development programme, and over the course of the winter break I was moved and touched by the experiences related in Dennis’ correspondence. He has agreed for his story to be shared below. Dennis comes from a family of four living in Nigeria and his desire to work in banking motivated his studies in Business Management then Banking and Finance at university. Post-graduation, rather than working in this sector, he started his own business while also collaborating with an independent organisation to gain a better insight into its operational management. He highlights that he also had a lot of marketing experience and briefly employed these skills with an oil and gas firm which was the last position he held before the Ebola crisis. Following his diagnosis with, and treatment for, Ebola, he decided to volunteer with the World Health Organization as a community mobiliser aiming to sensitise communities about the virus. As his passion for social work developed, he travelled to India for an 8-month training scheme from which he has recently returned, to become a social change-maker alongside running his own health promotion project. 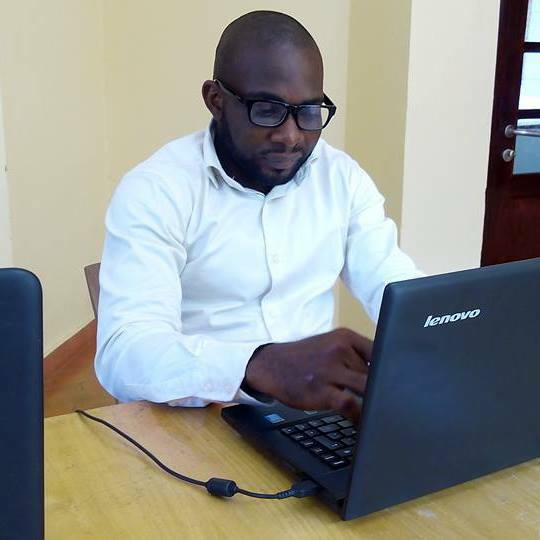 In his own words, Dennis shares his experience of Ebola: I became infected with Ebola through my late fiancée who was one of the nurses caring for Patrick-Sawyer, a Liberian-American lawyer who entered Nigeria carrying the virus. Tragically she, and her two-month old foetus, died two weeks following this exposure. I was the one who cared for her during her miscarriage caused by the viral load making the foetus non-viable and that was how I became exposed and infected. A couple of days after her death , I started experiencing the tell-tale Ebola symptoms (high fever, body and joint pains). I alerted the Lagos State Ministry of Health who immediately transferred me to a unit for testing which confirmed my fears. I was then placed in the isolation ward for care and treatment alongside other infected persons, under the management of Médecins Sans Frontières. I coped with being infected through retaining my characteristic positivity and relying on my Christian belief. In spite of my diagnosis and the limitations of the isolation ward, I continued with my normal habits such as morning push-ups, praying and reading. Ebola causes severe dehydration so I was given oral rehydration therapy and some therapeutic foodstuffs because we were told that these measures boosted the immune system and help fight the virus. As there was no cure available at this time, all treatment was maintenance based. Dennis recalls that he had very little trouble in both accessing and receiving treatment, instead citing psychological setbacks and stigma pre- and post-discharge from the isolation ward as his greatest challenges. He recalls how, in spite of his awful experience, he suffered rejection from friends, neighbours and people I relied on to lead a happy life. He continues: I was nearly evicted from my house, I lost my job during the process, and I couldn’t make purchases locally but instead had to travel further afield where I was effectively incognito. I always tell people that, in most cases, people don’t know their purpose in life until they undergo a tragic event such as the one I experienced. As an Ebola survivor, I have been given an opportunity to better understand what people facing similar stigmatising and life-threatening health traumas such as HIV/AIDS or cancer go through. I experienced what it means to be an outcast through discrimination. This was what prompted me to come up with a project that campaigns against stigma and discrimination of people living with HIV/AIDS and other infectious diseases that could cause them to be socially marginalised. Ebola has impacted my life to such an extent that I now see my purpose completely differently and I am able to use my story to bring healing to others – often those who have lost hope . At first, there was inadequate information and a lot of false communications surrounding the Ebola crisis in Nigeria, exacerbated by social media. For instance, one morning, a group who knew what had happened to my fiancée called me telling me that I should bathe in hot water mixed with salt. It was only after some days of delay that the local media started working effectively to educate the general public on how Ebola is spread and promote preventative measures. There was also a great deal of international coverage and Nigeria became a spotlight for many international media organisations. I remember giving interviews to news agencies including Aljazeera, the BBC, and more who came to my apartment to get first-hand information. Prior to my infection with Ebola I didn’t know much about the virus and had not heard of any intervention programmes. Moreover, while in the isolation ward, I only went online to check the survival count of people who had been infected. I needed to draw strength from their stories. Therefore, the singular most important intervention I was aware of was when Ebola spread to Nigeria because prior to this benchmark there was a dearth of information. I commend Nigeria for working alongside international organisations and NGOs and for being very proactive in their approach that was both supportive and sought to prevent further viral spread. From my own perspective, one lesson that should be learnt from the Ebola crisis is that governments and international organisations must ensure everyone is working together which was largely the case in Nigeria and so contributed to the rapid curtailment of the disease spread. No country should be left alone to handle their health challenges regardless of the disease and its characteristics. So too, people should always report themselves as quickly as possible if they have been exposed to Ebola – such timely personal and government intervention helped get the virus under control in my country. My initiative ‘JustCare’ organises projects such as workshops, campaigns, life-skills sessions and entrepreneurship training for people living with HIV/AIDS and other infectious diseases that could result in the infected person(s) experiencing stigma. We act as a united voice for people living with these diseases, and with the help of our partners, are slowly changing the way people think about HIV/AIDS by bridging the knowledge gap between how the virus spreads and its implications that exists among the general population of Nigeria. Currently our project is self-funded, and our immediate focus is to improve our social media presence and credibility. We believe that the more people see the little changes we are making, the more likely we are to gain their trust and support for future projects we already have in the pipeline. Our goal is to impact lives and employ the expertise of related organisations to create the change we want to see in Nigeria regarding HIV/AIDS. Presently, there has been a set-back from international donors for antiretroviral therapy (ART) funding and this is affecting those least able to access treatment. We believe there is still more to be done in this area and we want to give this initiative our best shot to save lives, reduce stigma and lower the infection rate in Nigeria.